The Hauran (Arabic: حوران‎ / ALA-LC: Ḥawrān) also spelled Hawran or Houran) is a region that spans parts of southern Syria and northern Jordan. It is bound in the north by the Ghouta oasis, in the east by the al-Safa field, to the south by Jordan's desert steppe and to the west by the Golan Heights. Traditionally, the Hauran consists of three subregions: the Nuqrah and Jaydur plains, the Jabal al-Druze massif, and the Lajat volcanic field. The population of the Hauran is largely Arab, but religiously heterogeneous; most inhabitants of the plains are Sunni Muslims belonging to large agrarian clans, while Druze form the majority in the eponymous Jabal al-Druze and a significant Greek Orthodox and Greek Catholic minority inhabit the Jabal's western foothills. The region's largest towns are Daraa, al-Ramtha and al-Suwayda. From the mid-1st century BCE, the region was governed by the Roman Empire's Herodian and Nabatean client kings until it was formally annexed by the empire in the 2nd century CE. The Hauran prospered under Roman rule (106–395 CE) and its villages functioned as largely self-governing units, some of which developed into imperial cities. The region continued to fare well in the Byzantine era (395–634), during which different Arab tribes ruled the Hauran on Byzantium's behalf, including the Salihids (5th century) and Ghassanids (6th century) until the Muslim conquest in the mid-630s. For much of the Islamic era until Ottoman rule (1517–1917), the Hauran was divided into the districts of al-Bathaniyya and Ḥawrān, which corresponded to the Classical Batanea and Auranitis, respectively. Muslim geographers variously described these districts as prosperous, well-watered and well-populated. Under the Romans, the grain of Batanea and the wine of Auranitis played an important role in imperial trade and throughout its history, the Hauran was the major source of the Levant's grain. The region saw a decline in the 17th century until increased demand for Syrian grain and improved security led to the agricultural revival and re-population of the Hauran in the mid-19th century. The region also historically benefited as a key transit area on the traditional Hajj caravan route to Mecca and later the Hejaz Railway. The Hauran remained Syria's breadbasket until it was largely supplanted by the country's north in the mid-20th century, which coincided with its separation from interdependent areas due to international borders and the Arab–Israeli conflict. Nonetheless, it persisted as an important agricultural and commercial transit area into the 2000s. However, during the Syrian Civil War, which was sparked in the Hauran in 2011, it became a major conflict zone between rebels and government forces until the latter reasserted control in 2018. The wide availability of basalt in the Hauran led to the development of a distinct vernacular architecture characterized by the exclusive use of basalt as building material and a fusion of Hellenistic, Nabatean and Roman styles. The durability of basalt is credited for the Hauran maintaining one of the highest concentrations of classical-era monuments in the world. Hauran towns such as Bosra, Qanawat, Shahba, Salkhad, Umm al-Jimal and numerous others contain Roman temples and theaters, Byzantine-era churches and monasteries, and forts, mosques and bathhouses built by successive Muslim dynasties. To the south of Jabal Kiswah and Jabal Khiyara begins the country of Hauran. It is bordered on the east by the rocky district of Lajat, and by the Jabal Hauran, both of which are sometimes comprised within the Hauran ... To the southeast, where Bosra and Ramtha are the farthest inhabited villages, the Hauran borders upon the desert. Its western limits are the chain of villages on the Hajj road, from Ghabaghib as far south as Ramtha ... Hauran comprises therefore part of Trachonitis and Iturea, the whole of Auranitis, and the northern districts of Batanea. The plain of Hauran stretches between the Marj plain of Damascus southward into modern-day Jordan where it borders Jabal Ajlun to the southwest and the desert steppe to the south and southeast. To the west is the Golan plateau and to the east are the uplands of Jabal Hauran. The plain has historically been divided into the northern Jaydur and the southern Nuqrah. The former is identified with the ancient Iturea, while the latter is identified with the ancient Batanea (al-Bathaniyya in Arabic). The much larger Nuqrah extends northward to the approaches of al-Sanamayn, being bound to the east by the Lajat and Jabal Hauran. It forms the heart of the Hauran plain. Al-Nuqra is a relatively recent appellation, meaning "the cavity" in Arabic. The Jaydur extends northwest from al-Sanamayn to the small lava field at the foothills of Mount Hermon (Jabal al-Shaykh in Arabic). A common feature throughout the Hauran is the basaltic topography, though altitude and soil vary between the Hauran's subregions The Nuqrah, Jaydur and Jabal Hauran consist of arable land derived from decomposed basaltic, volcanic rock. The Nuqrah is a relatively low plateau measuring roughly 100 by 75 kilometers (62 mi × 47 mi) with an average elevation of 600 meters (2,000 ft) above sea level. Its land is characterized by vast, contiguous tracts of fertile, basalt-derived soil. In contrast to the Nuqrah, the Jaydur's landscape is more fractured and rocky. It's average elevation ranges between 600–900 meters (2,000–3,000 ft) above sea level, with some volcanic cones reaching above 1,000 meters (3,300 ft) above sea level, including Tell al-Hara. In terms of its landscape and cinder cones, the Jaydur is a topographic continuation of the Golan Heights. The Jabal Hauran was formed by large lava flows into a roughly 60 by 30 kilometers (37 mi × 19 mi) massif of volcanic hills, the highest point of which is over 1,800 meters (5,900 ft) above sea level in the range's center. The Lajat comprises a topography of depressions, rifts and ridges with scattered arable patches, and is characterized by rocky soil and scarce vegetation. Its average elevation is between 600–700 meters (2,000–2,300 ft) above sea level, though some of the area's volcanic cones are over 1,000 meters (3,300 ft) with the highest over 1,150 meters (3,770 ft). Rainfall above the 200 millimeter mark is characteristic throughout the Hauran, but otherwise climate and precipitation levels vary between its subregions. The relatively frequent rainfall and the abundance of water springs have historically allowed the Nuqrah and Jabal Hauran to become major grain-growing regions. The Hauran plain receives an average 250 millimeters of rainfall, which allows the plains to support stable, grain-based agriculture. Jabal Hauran receives considerably greater rainfall, which supports more orchard and tree-based cultivation. Jabal Hauran is frequently covered by snow during the winter. There are records of settlements in the Hauran in the Ancient Egyptian Amarna letters and the Book of Deuteronomy of the Old Testament. The region was then known as Bashān. Control of it was contested between the Aramean kingdom of Damascus and the Kingdom of Israel during the 9th and 8th centuries BCE[clarification needed]. It was ultimately conquered and pillaged by the Assyrian Empire, which held onto it from 732 to 610 BCE. Bashan later saw security and prosperity under Achaemenid rule; its settlements became better developed and culturally Aramized. During the Hellenistic period beginning in the mid-4th century BCE, the Hauran was at first a possession of the Ptolemaic dynasty, which saw the region as a buffer zone separating their kingdom from Seleucid Damascus. Its sparse population consisted of semi-nomadic and nomadic groups such as the Itureans and Nabateans and the area remained largely undeveloped. The Seleucids conquered the Hauran following their victory over the Ptolemies in the Battle of Panium near Mount Hermon in 200 BCE. During the decline of the Seleucid Empire, the Petra-based Nabatean Kingdom emerged to the Hauran's south. The Arab Nabateans expanded their presence to the southern Hauran towns of Bosra and Salkhad. By the end of the 2nd century BCE, Seleucid control of the Hauran had become largely nominal and the region became a contested area between the Nabataean Kingdom, the Jerusalem-based Hasmonean dynasty and the Iturean principality based in the northern Golan and southern Mount Lebanon. By 63 BCE the Roman Empire extended its influence to all of Syria and initially charged local princes with keeping order in Auranitis (Jabal Hauran), Batanea (Nuqrah) and Trachonitis (Lajat). However, the districts remained largely in the hands of nomadic tribes. To supplement their meager income, these nomads often raided nearby settlements, as far as Damascus, and robbed pilgrims traversing the region. When Zenodorus, a prince entrusted with the Hauran districts' security, collaborated with the nomads, the Romans transferred the districts to their Judean client king, Herod the Great in 23 BCE. After Herod quelled resistance in the Hauran during the early years of his rule, the brigandage of the nomads largely ceased. Their rebellion resumed in 12 BCE and two years later, Herod renewed his efforts to bring the nomads to heel. This resulted in an alliance formed between the nomads of Trachonitis and Auranitis with the Nabateans in Transjordan which defeated Herod's Idumean troops. Herod ultimately stabilized the area after establishing permanent colonies and a network of forts in the less vulnerable Batanea district from which Herod's forces could keep order without attack by the nomads of Auranitis and Trachonitis. Through the establishment of security, land distribution and early tax incentives, Batanea prospered under Herod and his successors and became Syria's main source of grain. Auranitis began to similarly prosper during the reign of Philip, Herod's successor in the Hauran. By the early 2nd century CE, the last vassal kings of the Hauran region, Agrippa II (r. 53–100 CE) of the Herodian Tetrarchy and Rabbel II (r. 70–106 CE) of the Nabatean Kingdom had died and Rome under Emperor Trajan (r. 98–117) no longer saw the need for local intermediaries. The deaths of the Herodian and Nabatean monarchs in relatively quick succession provided an opportunity for the Romans to absorb their domains. Thus by 106, the empire formally annexed the entire Hauran, incorporating its southern part in Arabia Province and its northern part in Syria Province. The provincial boundary apparently followed the boundary just north of the Adraa–Bosra–Salkhad line that had separated the Herodian and Nabatean kingdoms. This administrative division remained for much of the 2nd century. This period, under the Antonine emperors who ruled until 180 CE, saw consistent stability, development and prosperity. For the first time since the Hellenistic age the Hawran in its entirety came under one administrative system. The road network and the settlements it linked were the framework upon which the economic and social infrastructure of the region was built. Secure towns and safe, well-maintained roads meant that internal and external commerce could flow freely. The wine and grain of the Hawran were marketed, we may assume, far and wide. After Rome's annexation, the rural villages of the Hauran exercised considerable self-rule. Each village had common areas and buildings, a law council and a treasury. Several underwent urbanization and became cities between the late 1st and 5th centuries, including Qanawat (Canatha), al-Suwayda (Dionysias), Shahba (Philippopolis), Shaqqa (Maxmimianopolis), al-Masmiyah (Phaina) and Nawa (Naveh). The inhabitants were generally wealthy landowners whose large dwellings housed their extended families. Among the inhabitants were Roman army veterans who upon returning to their villages in the Hauran invested money in land, houses, tombs, temples and public buildings and filled high-ranking local offices. Agriculture was the main economic sector, with Batanea and Auranitis mainly producing grain and wine, respectively, both of which were important to imperial trade. Much of the settled population consisted of Arameans, Jews and a larger Arab population, consisting of Nabateans and Safaitic groups. These groups continued to use Semitic languages, mainly Aramaic and an early form of Arabic at the colloquial level, though the Hellenization process was well underway and by the 4th century Greek supplanted the Hauran's native languages at the official level. Though the particularly wealthy and army veterans engaged in Hellenistic activities, such as visiting theaters and bathhouses, much of the population held on to Arab and Aramaic traditions and worshiped their native gods. Arab groups, including from South Arabia, continued to migrate to the Hauran well into the Byzantine period. During the 4th and 5th centuries, when direct imperial rule was weakened and nomadic groups overran the Sinai and Euphrates Valley, the Byzantines turned to certain powerful Arab tribes to maintain internal order and guard the Hauran. Beginning in the 4th century, this role was played by the Lakhmids, followed by the Salihids for much of the 5th century. These groups protected the population in return for payment in gold and corn. In the early 6th century, the Salihids were replaced by the Ghassanids. The Ghassanids, a large branch of the Azd tribal confederation, took abode in Arabia Province and like the Salihids, embraced Christianity. They became formal military allies of the Byzantines in 502, contributing troops in the wars with Sassanian Persia and the latter's Lakhmid vassals. In 531, the Ghassanid chieftain al-Harith ibn Jabalah was decreed "phylarch of all Arabs" in the empire, but by 582 his son and the last powerful Ghassanid phylarch al-Mundhir III was arrested and exiled. This led to a rebellion in the Hauran and a siege on Bosra led by al-Mundhir's son al-Nu'man VI, which only ended when the latter was allowed by the Byzantines to reestablish the Ghassanid phylarchy. This only lasted until Nu'man was exiled in 584, after which the empire dissolved the phylarchy into numerous, smaller Ghassanid and other Arab Christian units. Some of these units continued to fight alongside the Byzantines, but their overall power had diminished, leaving the area more vulnerable to invasion. In 613, the Sassanian Persians invaded Syria and defeated the Byzantines in a battle between Adraa and Bosra. The Byzantine era in the Hauran was marked by the dual processes of rapid Arabization and the spread of Christianity. The region's Ghassanid rulers were semi-nomadic and established permanent encampments throughout the Hauran, chief of which was al-Jabiyah, but also Aqraba, Jalliq, Harith al-Jawlan and others. They were entrusted by the Byzantines to secure the Hauran's agricultural production and stave off nomadic marauders. The region prospered under Ghassanid supervision and the tribe itself built or patronized secular and religious architecture in numerous villages, including churches, monasteries and large homes for their chieftains. Although a Christian presence in some cities of Auranitis was noted in the 2nd and 3rd centuries, by the 5th century, nearly all villages in the Hauran had churches, most of them dedicated to saints favored by the Arabs. The Ghassanids played a significant role in promoting Monophysite Christianity in Syria which was viewed as heretic by the Chalcedonian Church embraced by most Byzantine emperors. The emergence of the Muslim Arabs in Arabia and their expansion northward to Syria was countered by the Byzantines and their Arab Christian allies. However, the region's defenses had been significantly weakened as a consequence of the Ghassanids' decline in status in 582–584. The first Muslim forces arrived in the Hauran in April 634 and Bosra was conquered by them in May. Following the decisive Muslim victory in the Battle of Yarmouk in 636, all of the Hauran came under Muslim rule. The Umayyad dynasty took control of the expanding Islamic caliphate and relocated its capital from Medina to Damascus and found support from the people of Hauran. After the death of the Umayyad caliph Mu'awiyah II and the ensuing chaos of succession, the Umayyads' Arab tribal allies in Syria convened a summit in the Hauran town of al-Jabiyah where they chose Marwan I to be the next caliph in opposition to the ascendant Abd Allah ibn al-Zubayr. Following the Abbasids’ toppling of the Umayyads in 750, the Arab tribes of Hauran rose in a rebellion put down by the Abbasid general Abdallah ibn Ali. During the early Muslim period (7th-10th centuries), the Hauran was part of the military district of Damascus, itself a part of the larger province of Bilad al-Sham. The Hauran subdistrict roughly corresponded to the ancient Auranitis and its capital was Bosra, while the Bathaniyyah subdistrict corresponded to the ancient Batanea and had Adhri'at as its capital. Settlement in the Hauran continued and in some cases "thrived" in the early Islamic period with "no perceptible change in activity or cultural patterns under the Umayyad caliphs", according to historian Moshe Hartal. According to the 10th-century Muslim geographer Istakhri, the Hauran and Bathaniyyah were "two great districts of the Damascus Province. Their fields are rain-watered. The frontiers of these two districts extend down to ... the Balqa district and Amman." The Abbasid period in Hauran was marked by numerous, damaging raids from the Qarmatians of eastern Arabia in the 10th century. After 939, the Hawran and Bathaniyya districts came under the direct rule of the Egypt-based Ikhshidid dynasty, nominal governors of the Abbasids. During this period, the large Arab tribe of Banu Uqayl, formerly allies of the Qarmatians, migrated to the Syrian steppe extending from the Hauran northward to Upper Mesopotamia. After 945, the de jure Ikshidid ruler Abu al-Misk Kafur assigned the Uqayli sheikhs (chieftains) Salih ibn Umayr and Zalim ibn Mawhub with keeping order in the Hauran districts. This ended when the Fatimids conquered southern Syria in 970 and the Uqayl were consequently chased out of the Hauran by the Fatimid allied tribes of Banu Fazara and Banu Murra. The villages of Hawran and Bathaniyya were rehabilitated by the nominal Fatimid governor of Damascus, Abu Mahmud Ibrahim, in the early 980s after the damage inflicted on the area by the Fazara and Murra. The arrival of the Crusaders in the coastal regions of Bilad al-Sham in 1099 had repercussions for the Hauran and the region was periodically targeted by Crusaders in plundering campaigns. These occurred when the Crusaders captured Muslim-held fortresses in the Hauran or passed by the region after raids against Damascus. In the early 12th century, the entire Hauran was assigned by the Burid emir of Damascus to the Turkish general Amin al-Dawla Kumushtakin as an iqta (fief), which he held until his death in 1146. Under his patronage, the region, and Bosra in particular, saw a renewal of building activity after a roughly 300-year hiatus. The population of the Hauran at the time was largely Greek Orthodox Christian. The last recorded appearance of the Crusaders in Hauran was in 1217. The Ayyubids conquered the region in the late 12th century, but their rule collapsed in Syria following the Mongol invasion in 1260. That year the Mongols were defeated by the Mamluks at the Battle of Ain Jalut and Syria, including the Hauran, came under Mamluk rule. During the 12th and 13th centuries, the Hauran continued to be administratively divided into the Hauran and Bathaniyyah districts of Damascus. In general, both districts were well-populated and prosperous, benefiting particularly from grain production. Though mostly Muslim, a significant portion of the inhabitants were Christians. A contemporary Syrian geographer Yaqut al-Hamawi (died 1229) described the Hauran as "a large district full of villages and very fertile". Following its incorporation into the Mamluk Sultanate, the Hauran continued to be divided into the two districts of the Bosra-centered Hauran and the Adhri'at-centered Bathaniyyah. However, within the region were the two smaller administrative units of Salkhad, a fortress town typically held by a high-ranking Mamluk emir, and Zur’, which corresponded with the Lajat. Under the Mamluks, the region's strategic importance stemmed from its position on the barid (postal route) between Gaza and Damascus and Bosra's role as a major marshaling point for the Hajj caravans going to Mecca. The arrival of nomadic clans from the Banu Rabi'a tribe in the 14th century caused instability in the region, but they eventually became settled inhabitants. The Hauran was incorporated into the Ottoman Empire following its conquest of Mamluk Syria in 1517. In the early Ottoman era, during the 16th and 17th centuries, there were numerous agrarian, primarily grain-growing villages in the Hauran plain and the western slopes of Jabal Hauran. Most of the inhabitants paid taxes on wheat and barley. The Hauran had long been a major grain-producing region and officially, its land belonged to the Ottoman state and its inhabitants were required to pay taxes and be conscripted into the army. However, as state authority receded, the region effectively became autonomous. An exception to this virtual autonomy came during the annual thirty to sixty-day Hajj season, during which the state mobilized its forces to organize, protect and supply the annual Muslim pilgrim caravan to Mecca and Medina; In the 18th century, the Hajj route was moved westward to Muzayrib, which became the caravan's marshaling point in the Hauran. This hinterland political system had its own internal checks and, of course, its strains, but it appears to have existed with a fair degree of equilibrium for a very long period of time. The low pressure of population on the land and the natural economies that existed between steppe and cultivated plain and between town and countryside appear to have contributed to this relatively stable situation. As state authority receded in the Hauran, Bedouin tribes from the Anaza confederation, increasingly took advantage of the security vacuum. The Bedouin encamped in the Hauran in the spring and retreated into the desert as soon as the autumn rains began. The Anaza's entry into the Hauran caused the exodus of the semi-nomadic tribes of the Banu Rabi'a confederation. The largest tribes that encamped in the Hauran were the Wuld Ali (also known as Awlad Ali), who arrived in the early 18th century, and the Rwala, who arrived in the late 18th century. Both were part of the Anaza confederation. Smaller tribes included the Sardiyah, the Sirhan and the Sulut. The latter was the only Bedouin tribe that remained relatively stationary, and was based in the Lajat wilderness. The Bedouin used the Hauran to access water, graze their camels and sheep and stock up on supplies for the winter. They traded their livestock and meats for grains from the plainsmen and wares from other Syrian merchants. The Hajj caravan was a major source of income for the Bedouin, who supplied the pilgrims with protection, logistical support, meat and transportation. Bedouin depredations against the locals included the imposition of the khuwwa (tribute) ostensibly in return for protection. The Bedouin also launched occasional raids and their flocks often grazed on the plainsmens' fields. In addition to Bedouin newcomers, the 18th and 19th centuries also witnessed large migrations of Druze from Mount Lebanon to the Jabal Hauran, which gradually became known as the Jabal al-Druze (mountain of the Druze). Their arrival pushed the mountain's previous inhabitants to move to the Hauran plains and introduced a new element of instability to the region. A small group of Druze led by the 'Alam ad-Din family first arrived in 1685. A much larger wave arrived in the region as a result of the intra-Druze Battle of Ain Dara in 1711. The new arrivals were concentrated in the northwestern corner of Jabal Hauran and the Lajat and established roots in abandoned villages with extensive ancient ruins. The area was chosen by the Druze because it was well-watered, defensible and proximate to their coreligionists in the Damascus countryside and Mount Hermon. The paramount leaders of the community between 1711 and 1860 were the Najran-based Al Hamdan family. Persistent migrations of Druze from Mount Lebanon, Wadi al-Taym and the Galilee in response to the increased turbulence they faced in these regions continued throughout the 18th century; historian Kais Firro stated that "each sign of danger in their traditional lands of settlement seemed to instigate a new Druze migration to the Hauran". Towards the end of the decade-long Egyptian administration of Syria, the Druze of Jabal Hauran launched their first revolt against the authorities, in this case in response to a conscription order by Ibrahim Pasha. By then, their numbers in the region had swelled due to migration. The 1860 Mount Lebanon civil war between the Druze and Christians and the resulting French military intervention caused another large exodus of Druze to Jabal Hauran. The Hauran plains declined economically and demographically during the 17th and 18th centuries. Factors that caused this decline included the virtual dual taxation of the peasantry by the government and the Bedouin, the latter's periodic raids, the encroachments of Bedouin livestock in the grain fields and occasional strife with the neighboring Druze, Ottoman irregulars and between themselves. Many southern plainsmen migrated to the northern Hauran plain, whose soil was more productive in comparison to the drier south, which was also more often overrun by the Bedouin and their herds. According to Lewis, southern Haurani plainsmen "had been moving northwards for generations". Thus, by the beginning of the 19th century, the northern plains contained several full or half-empty villages, while the south had been all but deserted with the exception of the larger towns of Daraa (Adhri'at), Bosra and al-Ramtha. Grain being threshed in Daraa, 1906. Grain was the chief crop of the Hauran, the cultivation of which led to the region's revival in the second half of the 19th century. Increased demand for grain in both the Damascene and European markets led to a resurgence of grain cultivation in the Hauran beginning in the 1850s. This in turn brought about the mass resettlement of abandoned villages and the establishment of new settlements. Resettlement also caused a scarcity of land for Bedouin herds to graze by the decade's end. The civil war of 1860, which spilled over into Damascus, where thousands of Christians were massacred spurred the Ottomans to expand their centralization efforts in Syria. Prior to 1860, the Hauran had been largely excluded from the Tanzimat centralization reforms. In January 1861, Governor Fu'ad Pasha attempted to integrate and reorganize the region, which was followed by largely unsuccessful attempts by four successive Ottoman governors. At the time, the Hauran's leadership consisted of the chiefs of the largely pacified clans of the plains, such as Al Miqdad and Al Hariri; the more rebellious chiefs of the Druze clans of Jabal Hauran, such as Al Hamdan and Bani al-Atrash; and the chiefs of the Bedouin tribes of Rwala, Wuld Ali, Sirhan and Sardiyah whose herds seasonally grazed the Hauran plains. The centralization efforts, backed by the Damascene aghawat, faced stiff resistance by the Druze of Ismail al-Atrash and a coalition he formed that included the Bedouin and many of the Haurani plainsmen. This coalition was defeated in 1862 and the government came to terms with al-Atrash, entrusting him to collect taxes from the entire Hauran and to pay heavy fines in place of conscription. Though this did not translate into the ultimate goal of integrating the Hauran, and the Bedouin continued their rebellions in 1863–1864, it still ended the region's virtual autonomy. Not until the appointment of Rashid Pasha did centralization efforts take hold. Rashid sought to change the general view in the Hauran that the government was an alien power only intent on collecting taxes and conscripting its youth. He accomplished this by according the chiefs of Wuld Ali and Rwala adequate grazing lands; granting the leaders of the plainsmen and the Druze certain privileges and state functions; and replacing the aghawat as the state's intermediaries with the locals whilst utilizing them for military campaigns in Transjordan and facilitating the Hajj caravan. Tax concessions were also granted, but Ottoman troops remained as Rashid Pasha viewed their presence as a force of stability. As part of the Hauran's reorganization, a new administrative district, the Hauran Sanjak, was formed and included Jabal Hauran, the Nuqrah and Jaydur plains, the Golan plateau, the Balqa plain and Jabal Ajlun. Rashid Pasha also pressed wealthy Syrians to take advantage of the 1858 Land Code and auctioned massive tracts of state land. From 1869 onward, many Damascene merchants and landowners and entrepreneurial Haurani farmers invested in these lands, increasing agricultural production. With these investments came a reinforced military presence and a consequent reduction in Bedouin raids. These combined factors made the peasantry “feel themselves more protected and risk further settlement", according to German archaeologist Gottlieb Schumacher. Into the 1870s and 1880s, the peasants of the Hauran, including the Druze, persisted in their agitation against the central government, European commercial interests and their own leaders. However, security in the plains and an end to Bedouin tribute collection had been largely secured and continued into the 20th century. To illustrate the extent of the Hauran's cultivation in the mid-1890s, Schumacher noted that "no hectare of good land was without its owner". The central plain had become entirely cultivated or settled, Daraa and Bosra grew significantly and many of the hamlets established or reestablished in the 1850s had become large villages. In 1904, the annual Hajj caravan and Muzayrib's role in it was replaced by the construction of the Hejaz Railway. 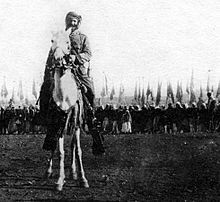 At the end of World War I, the Hauran was captured by the Arab army of Emir Faisal which held the area for about two years until French forces occupied Damascus in July 1920 to enforce the French Mandatory rule in Syria. A revolt broke out in the Hauran in response to the entry of French forces. Following the suppression of the Great Syrian Revolt, which began in the Hauran, the area experienced a degree of prosperity and security as its inhabitants remained protected from the incursions of the Bedouin tribes. Under French Mandatory rule, the Hauran plains formed an eponymous district within the State of Damascus, while the Jabal Hauran formed the Jabal Druze State. Its total population was 83,000 and included 110 villages. Its principal population centers were the small towns of Daraa, Bosra, Izra and Nawa. The district was subdivided into two qadaat (subdistricts), the southern one centered in Daraa and the northern one in Izra. In the period following Syria's independence from France in 1946, the Hauran developed into "a busy and prosperous region", according to Sourdel. It remained a significant source of the country's grain and formed the area crossing Damascus in the north and Jordan to the south. It was often a place where Bedouin came to trade their wool and butter for other commodities. However, during roughly this same period, following World War II, the Hauran also lost much of its importance to Syria's national economy. Though it continues to supply grain to Damascus, its role as the 'granary of Syria' has been eclipsed by the country's northern and northeastern regions. The Hauran's agriculture has been limited by its dependence on rain and underground reservoirs. Moreover, the region's economic potential has been curtailed by the creation of international borders and the Arab–Israeli conflict, which have separated it from previously interdependent areas that are located today in Israel, Lebanon and Jordan. In particular, the dual loss of Palestine as an alternative market to Damascus and of Haifa as the Hauran's main economic outlet to the Mediterranean sea have also contributed to its economic decline. Unlike other rural regions in Syria, most land in the Hauran was not concentrated in the hands of large owners, being owned instead by small or medium-sized proprietors. Thus, the region was not as affected by the Agrarian Reform Law passed in 1958 during the United Arab Republic period (1958–1961) and enforced by the Ba'ath Party government in 1963, which effected land redistribution and mostly targeted large landowners. According to historian Hanna Batatu, parts of the Hauran, such as Bosra and its surroundings, were "pretty much left to their own devices" during the presidency of Hafez al-Assad (1970–2000). Politically, many of the clans that dominated local politics under the French, continued doing so under the Ba'ath. Economically and socially, however, the higher levels of leadership within the clans declined and influence gradually became diffuse among lower-ranking members. During the presidency of Bashar al-Assad (2000–present), the Hauran remained an important agricultural region. Its principal city, Daraa, was a major transit hub for commercial traffic between Syria, Jordan, Saudi Arabia and Turkey as well as the smuggling of goods between these countries. The Syrian Civil War was sparked in the Hauran town of Daraa when anti-government demonstrations were organized in response to the detention and alleged torture of a group of teenagers by the local branch of the security forces. As the revolt spread in the Hauran, anti-government forces utilized their clan networks extending to Jordan and the Arab Gulf states to smuggle funds and weapons, sustaining the rebellion. According to historian Nicholas Heras, these clans generally “shared common grievances” against the government of President Assad. During the course of the war, they formed loosely-coordinated rebel militias fighting under the banner of the Free Syrian Army-affiliated Southern Front. The latter claimed it had the allegiance of some fifty armed groups with a collective strength of 30,000 fighters. Anti-government Salafist armed groups, such as the Nusra Front, also gained increasing influence, at times challenging or cooperating with the Southern Front. Until 2018, rebel groups controlled large areas on either side of the main north-south Damascus-Daraa highway and the Nasib border crossing, though the Syrian Army (SAA) and its affiliates controlled the highway corridor itself. Meanwhile, the pro-government Druze Muwahhidin Army largely stayed out of the fighting and secured the Jabal Hauran. In June 2018, the Syrian government launched an offensive to recapture the rebel-held areas of the Daraa and Quneitra governorates. By the end of July, the entire Hauran was under government control, including a pocket of territory in the Yarmouk basin held by the Islamic State of Iraq and the Levant (ISIL). Though some rebels and their families opted to relocate to rebel-held Idlib, most rebel factions surrendered in reconciliation deals with the government and remained in their hometowns. A number of rebel groups also joined the Syrian Army offensive against ISIL. The population of the Hauran region is religiously heterogeneous. Largely agrarian Sunni Muslim Arabs form a majority in the Hauran plain in Syria and Jordan and are known as Ḥawarna (sing. Ḥawrānī). In addition to the indigenous Ḥawarna, the plains are also populated by communities of former Bedouin tribes who gradually became settled and Circassians who arrived in the second half of the 19th century. The Druze form a majority in the Jabal Hauran, which is part of the al-Suwayda Governorate. There is a significant Christian population, both Greek Orthodox and Greek Catholic (Melkite), in the Hauran region as a whole, though most Christians are concentrated in the towns and villages straddling the western foothills of Jabal Hauran. [note 1] A sizable Shia Muslim community whose origins are from Nabatieh, Lebanon make up about 40% of Bosra's population. The social structure of the Hauran plain is characterized by networks of large extended clans, such as the Hariri, Zu'bi, Miqdad, Abu Zeid, Mahamid, Masalma and Jawabra. The Zu'bi are the largest clan, inhabiting some sixteen villages in the Daraa and Izra districts. They also have an extensive presence across the border in the Irbid Governorate, particularly in the cities of al-Ramtha and Irbid. They form the predominant group in the city of Daraa and many of its surrounding villages. [note 2] Altogether, they number some 160,000 members in southern Syria and northern Jordan. The second largest clan are the Hariri who generally inhabit eighteen villages, many of the same villages inhabited by the Zu'bi. Their members are mostly concentrated just north of Daraa in Abtaa, Da'el, and al-Shaykh Maskin. The Miqdad are predominant in many of the villages southwest of Daraa. [note 3] They are also the largest clan in the city of Bosra, but are predated there by the smaller al-Hamd clan. The tribesmen of Nu'aym (also spelled Na'imeh) are predominant in the towns of al-Shaykh Maskin, Jasim and Nawa in the Izra District, the villages of north-central al-Sanamayn District and in the Quneitra Governorate. Smaller clans like the Rifa'i are concentrated in Ataman and Nasib while the Masalma, Mahamid and Abu Zeid are concentrated in Daraa city. Among the settled Bedouin are many Anaza tribesmen who made Daraa city their home alongside its traditional agrarian clans. In addition, members of the Shammar tribal confederation from northeastern Syria have migrated to the city for economic reasons. Like the agrarian Sunni clans of the plains, the Druze in Jabal Hauran were traditionally organized in a hierarchical clan order that saw a disparity in the distribution of social influence and prestige. The Bani al-Atrash are the leading clan and predominate in some sixteen towns and villages, mostly in the southern parts of Jabal Hauran. [note 4] In the northern parts, the Bani 'Amer predominate in eleven villages,[note 5] while the other major clan in the northern Jabal Hauran was the Halabiya family. [note 6] Though the Bani al-Atrash and Bani ‘Amer were the more powerful clans in the governorate, members of the Banu Assaf of Attil, Salim and Walghah and Bani Abu Ras of al-Ruha historically dominated the judiciary, while the Hajari, Hinnawi and Jarbu families historically provided the Druze community's religious leadership in Qanawat. The Hauran has its own vernacular architectural tradition, known as the "Hawrani style", which is characterized by a number of distinctive factors. One of these is the exclusive use of basaltic stone for building material. Known for its hardness and black color, basalt is readily available throughout the region and until recent decades, was used for nearly all construction work done in the Hauran. Due to the lack of timber, basalt was also used for doors, window seals and ceilings, taking the usual place of wood. The reliance on basalt in the Hauran "formed a truly lithic architecture“, according to Fleming Aalund. The "tensile strength" of basalt enabled the "development of unusual building techniques", according to historian Warwick Ball. Among these methods was the cutting of long, narrow beams from basalt to roof large areas spanning 10 meters or longer. Because of the size restrictions of the beams, a distinctive system of traverse, semi-circular arches was devised to support the roof. Corbels, typically no longer than 4 meters, were used to expand the intervals between the arches and the walls. This method "gave rise to the distinctive, cantilevered 'slab and lintel' architectural style that is peculiar to the black basalt areas of the Hauran", according to Ball. The fusion of Nabatean, Hellenistic and Roman styles also characterizes the architecture of the region. Hawrani-style architecture is dated to at least the 1st century CE when the Nabateans moved their capital from Petra to Bosra. The Nabateans were avid builders with their own distinctive architectural tradition. After the Roman annexation of the Nabatean Kingdom in 106, the area experienced a building boom that lasted until the onset of strife and instability in the mid-3rd century. Though the Roman contribution was highly influential to the region's architecture, the Hauran's Nabatean inhabitants largely maintained their own building traditions, particularly in the smaller towns. The architecture of the Byzantine era was influenced by the concurrent spread of Christianity and the consequent construction of churches, monasteries and other religious edifices, the majority dating between the 4th century and early 6th century. Surveys of the region indicated that a long period of uninterrupted building activity took place in the Hauran between the Nabatean period in the 1st century to the Umayyad period in the 7th century. The region's pre-Islamic architectural tradition became the basis for later Islamic building works in the Hauran, particularly in Bosra in the 12th–14th centuries. However, the Muslim patrons of these works also introduced outside elements, mostly inspired by Damascene architecture, to give their projects their own stately character. There is no other country in the world where the architectural monuments of antiquity have been preserved in such large numbers, in such perfection, and in so many varieties as in North Central Syria [the Dead Cities] and in the Hauran. There are many places where the minor details of buildings, such as wall-paintings and mosaics, are in a better state of preservation; but there is no [other] region where numbers of towns of undoubted antiquity stand unburied, and still preserving their public and private buildings and their tombs in such a condition that, in many cases, they could be restored, with a small outlay, to their original state. When Classical-era sites were largely resettled in the late Ottoman era, many of the Hauran's ancient monuments were turned into houses. The earliest surveys of the Hauran's arcaeological sites were taken in the 19th century by the French archaeologist Melchior de Vogüé between 1865 and 1877, S. Merrill in 1881 and Schumacher in 1886 and 1888. The most thorough and abundant documentation was recorded in surveys carried out by Butler and his team from Princeton University in 1903 and 1909 and then published in a series of releases between 1909 and 1929. In 1913, Butler also surveyed Umm al-Jimal, which contained numerous ruins, some as high as three stories. The period in which these surveys were carried out coincided with the Hauran's mass resettlement. This resulted in the partial damage of some sites due to their occupation as homes or as a source of masonry for new buildings, a process which continuously increased in later years. Renewed interest in the Hauran's ancient sites began in the 1970s. Umm al-Jimal was surveyed between 1972 and 1981 by French archaeologist Bert de Vries and reports from that expedition were published in 1998. Surveys of the Hauran plain in Syria were carried out by French expeditionary teams led by François Villeneuve in 1985 and Jean-Marie Dentzer in 1986. Early photographs of Hauran's archaeological sites, taken in the late 19th and early 20th centuries by German explorer and photographer, Hermann Burchardt, are now held at the Ethnological Museum of Berlin. ^ Localities in the Hauran with Christian pluralities or majorities include Aslihah, Anz, Dara, Bassir, Hit, Jubayb, Izra, Khabab, Kharaba, Namer, Sama al-Bardan and Tubna. ^ The villages of the Zu’bi clan include 'Ataman, Da'el, al-Jiza, Khirbet Ghazaleh, al-Musayfirah, Muzayrib, Nasib, al-Na'ima, Saida, al-Ta'iba, Tafas and al-Yadudah. ^ The villages of the Miqdad clan include Ghasm, Ma'araba and Samaqiyat. ^ The localities inhabited by the Bani al-Atrash include the cities of al-Suwayda and Salkhad, and the villages of al-Annat, Anz, Awas, Dhibin, al-Ghariyah, al-Huwayyah, Ira, Malah, al-Qurayya, Qaysama, Rasas, Umm al-Rumman and 'Urman. ^ The villages inhabited by the Bani ‘Amer include Shahba, Amrah, Braykah, al-Buthainah, al-Hayyat, al-Hit, Mardak, al-Matunah, al-Suwaymrah and Ta'lah. ^ The Halabiya predominate in the Wadi al-Liwa area, including al-Hit, al-Sura and al-Tha'lah. ^ a b c d e f g h i j k l m n o p q r s t u v w x y z aa ab ac ad Sourdel 1971, p. 292. ^ a b c d e f g h i j k l m n o Rohmer 2008, p. 1. ^ Brown 2009, p. 377. ^ Zerbini 2013, p. 56. ^ a b Ma'oz 2008, p. 35. ^ a b c d e f Urman, ed. Hartal 2006, p. 4. ^ Honigman 1995, p. 114. ^ a b c d e f g h i j k l m n o Ball 2016, p. 238. ^ a b Gaube 1982, p. 593. ^ "Climate Bosra". Climate-Data.org. Retrieved 25 October 2018. ^ "Dara'a". World Meteorological Organization. Retrieved 25 October 2018. ^ "Climate Nawa". Climate-Data.org. Retrieved 25 October 2018. ^ "Climate Al Ramtha". Climate-Data.org. Retrieved 25 October 2018. ^ "Climate As Suwayda". Climate-Data.org. Retrieved 25 October 2018. ^ a b c d Urman, ed. Hartal 2006, p. 269. ^ Rohmer 2008, pp. 1–2. ^ a b c Urman, ed. Hartal 2006, p. 271. ^ a b c d Urman, ed. Hartal 2006, p. 273. ^ Urman, ed. Hartal 2006, p. 272. ^ a b Urman, ed. Hartal 2006, p. 274. ^ Urman, ed. Hartal 2006, p. 277. ^ a b Urman, ed. Hartal 2006, p. 280. ^ a b c d e Urman, ed. Hartal 2006, p. 279. ^ Urman, ed. Hartal 2006, p. 281. ^ MacAdam 2002, pp. 644–645. ^ a b MacAdam 2002, p. 645. ^ a b c d e f g h i Urman, ed. Hartal 2006, p. 284. ^ a b c d e f g h i j Urman, ed. Hartal 2006, p. 287. ^ a b c d Urman, ed. Hartal 2006, p. 288. ^ a b c d e Urman, ed. Hartal 2006, p. 289. ^ Urman, ed. Hartal 2006, p. 285. ^ Le Strange 1890, pp. 33–34. ^ a b c d Amabe 2016, pp. 31–32. ^ Amabe 2016, p. 47. ^ Runciman 1951, p. 241. ^ a b c d e f g h i j k l m n o p q r s t u v w x y z aa ab ac ad ae af Sourdel 1971, p. 293. ^ a b Brown 2009, p. 379. ^ a b Schilcher 1981, pp. 159–160. ^ Schilcher 1981, p. 159. ^ a b c d e Schilcher 1981, p. 160. ^ a b c d e Schilcher 1981, p. 164. ^ a b Schilcher 1981, p. 165. ^ a b c Firro 1992, pp. 39–40. ^ a b c Schilcher 1981, p. 161. ^ Schilcher 1991, p. 168. ^ Schilcher 1981, p. 162. ^ Schilcher 1981, p. 163. ^ Schilcher 1981, pp. 168–169. ^ a b c Schilcher 1981, p. 170. ^ Schilcher 1981, p. 171. ^ a b c Schilcher 1981, p. 173. ^ Schilcher 1981, p. 174. ^ Schilcher 1981, p. 175. ^ a b c d Schilcher 1981, p. 176. ^ a b c d e f g h i j k l m n o p q r s t Heras, Nicholas A. (June 2014). "A Profile of Syria's Strategic Dar`a Province". CTC Sentinel. Combating Terrorism Center. 7 (6). ^ a b c d Wege 2015, p. 36. ^ a b Wege 2015, p. 42. ^ a b c d Shaheen, Kareem (2018-07-31). "Syrian government forces seal victory in southern territories". The Guardian. Retrieved 3 November 2018. ^ a b "Middle East Report, No. 163: New Approach in Southern Syria" (PDF). International Crisis Group. 2015-09-02. p. 7. Retrieved 2016-05-25. ^ Betts 1988, p. 60, n. 11. ^ Batatu 1999, pp. 25–26. ^ Batatu 1999, pp. 26–27. ^ a b Zerbini 2013, p. 52. ^ a b c d e f Aalund 1991, p. 35. ^ Aalund 1991, p. 17. ^ a b c Ward-Perkins 1994, p. 339. ^ a b Aalund 1991, p. 18. ^ a b Ball 2016, p. 241. ^ a b c d e f g h Urman, ed. Hartal 2006, p. 7. ^ The castle (citadel) of Salkhad, photographed by Hermann Burchardt (click on photo to enlarge it); Melach Es-Sarrar (Malah) in Hauran, in 1895; Dibese, 400 meters west of Suwayda; Qasr (fortress) al-Mushannaf, in Hauran (click to enlarge); The citadel, Khirbat al-Bayda, in Hauran (1895); The ruins of Khirbet al-Bayda. Wikimedia Commons has media related to Hauran. Amabe, Fukuzo (2016). Urban Autonomy in Medieval Islam: Damascus, Aleppo, Cordoba, Toledo, Valencia and Tunis. Leiden: Brill. Ball, W. (2016). Rome in the East: The Transformation of an Empire (2nd ed.). Abingdon: Routledge. ISBN 978-0-415-72078-6. Betts, Robert Brenton (1988). The Druze. New Haven: Yale University Press. ISBN 0-300-04100-4. Bosworth, C.E. (1991). "Marwān I b. al-Ḥakam". In Bosworth, C. E.; van Donzel, E.; Pellat, Ch. (eds.). The Encyclopaedia of Islam, New Edition, Volume VI: Mahk–Mid. Leiden: E. J. Brill. pp. 621–623. ISBN 90-04-08112-7. Brown, Robin M. (2009). "The Druze Experience at Umm al-Jimal: Remarks on the History and Archaeology of the Early 20th Century Settlement" (PDF). Studies in the History and Archaeology of Jordan. Amman. X.
Butler, H.C. (1903). Architecture and other Arts. New York: Century Co.
Firro, Kais (1992). A History of the Druzes. 1. BRILL. ISBN 9004094377. Gaube, H. (1986). "Ladjāʾ". In Bosworth, C. E.; van Donzel, E.; Lewis, B.; Pellat, Ch. (eds.). The Encyclopaedia of Islam, New Edition, Volume V: Khe–Mahi. Leiden: E. J. Brill. p. 593. ISBN 90-04-07819-3. Honigman, E. (1995). "Al-Nukra". In Bosworth, C. E.; van Donzel, E.; Heinrichs, W. P.; Lecomte, G. (eds.). The Encyclopaedia of Islam, New Edition, Volume VIII: Ned–Sam. Leiden: E. J. Brill. p. 114. ISBN 90-04-09834-8. King, G.R.D. (1989). "The Umayyad Qusur and Related Settlements in Jordan". In Bakhit, Muhammad Adnan; Schick, Robert (eds.). The Fourth International Conference on the History of Bilād al-Shām during the Umayyad Period: Proceedings of the Third Symposium, Volume 2. Amman: University of Jordan Press, Bilad al-Sham History Committee. Lewis, Norman (2000). "The Syrian Steppe during the Last Century of Ottoman Rule: Hawran and the Palmyrena". In Mundy, Martha; Musallam, Basim (eds.). The Transformation of Nomadic Society in the Arab East. Cambridge: Cambridge University Press. pp. 33–43. ISBN 0521770572. MacAdam, Henry Innes (2002). Geography, Urbanisation and Settlement Patterns in the Roman Near East. Abingdon: Ashgate Publishing. ISBN 978-1-138-74056-3. Ma'oz, Zvi Uri (2008). The Ghassānids and the Fall of the Golan Synagogues. Archaostyle. Meinecke, M. (1996). Patterns of Stylistic Changes in Islamic Architecture: Local Traditions versus Migrating Artists. New York: New York University Press. ISBN 0-8147-5492-9. Rogan, E. (1994). "Bringing the State Back: The Limits of Ottoman Rule in Transjordan, 1840–1910". In Rogan, Eugene L.; Tell, Tariq (eds.). Village, Steppe and State: The Social Origins of Modern Jordan. London: British Academic Press. ISBN 1-85043-829-3. Rohmer, Jérôme (September 2008). "Late Hellenistic Settlements in Hawrân (Southern Syria). Survival of Proto-historic Urbanism and Village Architecture in a Hellenized Context" (PDF). Bollettino Di Archeologia On Line. Runciman, S. (1951). A History of the Crusades, Volume II: The Kingdom of Jerusalem and the Frankish East, 1100-1187. Cambridge: Cambridge University of Press. ISBN 0521061628. Schilcher, L. Schatkowski (Fall 1991). "The Great Depression (1873-1896) and the Rise of Syrian Arab Nationalism". New Perspectives on Turkey. 6. doi:10.15184/S089663460000039X. Schilcher, L. Schatkowski (1981). "The Hauran Conflicts of the 1860s: A Chapter in the Rural History of Modern Syria". International Journal of Middle East Studies. 13. doi:10.1017/S0020743800055276. Sourdel, D. (1971). "Ḥawrān". In Lewis, B.; Ménage, V. L.; Pellat, Ch. ; Schacht, J. (eds.). The Encyclopaedia of Islam, New Edition, Volume III: H–Iram. Leiden: E. J. Brill. pp. 292–293. Urman, Dan (2006). Hartal, Moshe (ed.). Rafid on the Golan: A Profile of a Late Roman and Byzantine Village. British Archaeological Reports International Series 1555. Oxford: Archaeopress. ISBN 1841719846. Ward-Perkins, J.B. (1994). Roman Imperial Architecture. New Haven: Yale University Press. ISBN 0300052928. Wege, Carl Anthony (September 2015). "Urban And Rural Militia Organizations In Syria's Less Governed Spaces". Journal of Terrorism Research. 6 (3). doi:10.15664/jtr.1123.